A fast prime featuring an advanced optical design. 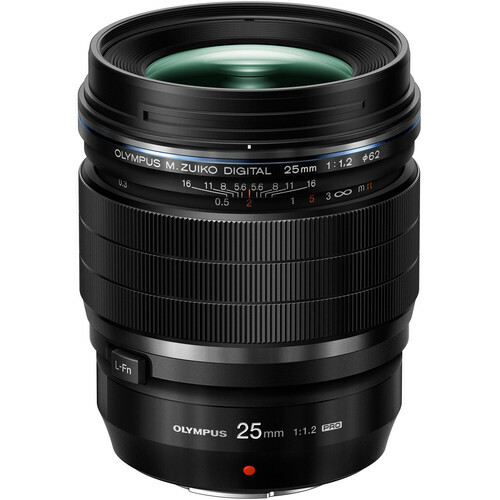 The M.Zuiko 25mm f1.2 PRO Lens is a 50mm equivalent lens designed for Micro Four Thirds mirrorless cameras. Its unique 19 elements, 14 groups construction incorporates extra-low dispersion, aspherical, and high refractive index elements to significantly reduce both chromatic and spherical aberrations for notable image clarity, sharpness, and colour accuracy. The lens is characterized by a bright f1.2 max aperture, ideal for working in low-light conditions. A nine-blade aperture creates smooth rounded bokeh.